At the start of your turn, put a Curse into your hand. Murkwater Shaman is an epic Agility creature card. It is part of the Core Set. In addition to the card's availability in the Core Set, one copy is included in the Paarthurnax's Roar theme deck, and one copy in the Telvanni Ambition theme deck. 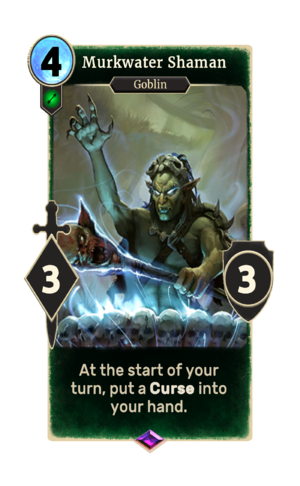 The card is named for ESO's Murkwater Tribe.